Updated: Jan. 14, 2019 at 3:22 p.m.
GW’s six historically black sororities and fraternities will now be unified under one umbrella organization. The National Pan-Hellenic Council, a black Greek-letter organization, returned to GW last semester after leaving campus for at least a decade. Student leaders and officials said the council, which wrote its bylaws in the fall, brings black Greek-letter chapters together under a body that can fundraise and facilitate community service opportunities. The NPHC originally launched at Howard University in 1930, overseeing nine historically black sororities and fraternities known as the “Divine Nine,” according to the council’s national website. GW currently has six active chapters of the Divine Nine: sororities Alpha Kappa Alpha, Inc., Delta Sigma Theta, Inc. and Zeta Phi Beta, Inc., and fraternities Alpha Phi Alpha, Inc., Kappa Alpha Psi, Inc. and Phi Beta Sigma, Inc.
Simone Hunter-Hobson, the president of the NPHC and a member of Delta Sigma Theta Sorority, Inc., said the council existed years ago but officially restarted this academic year. 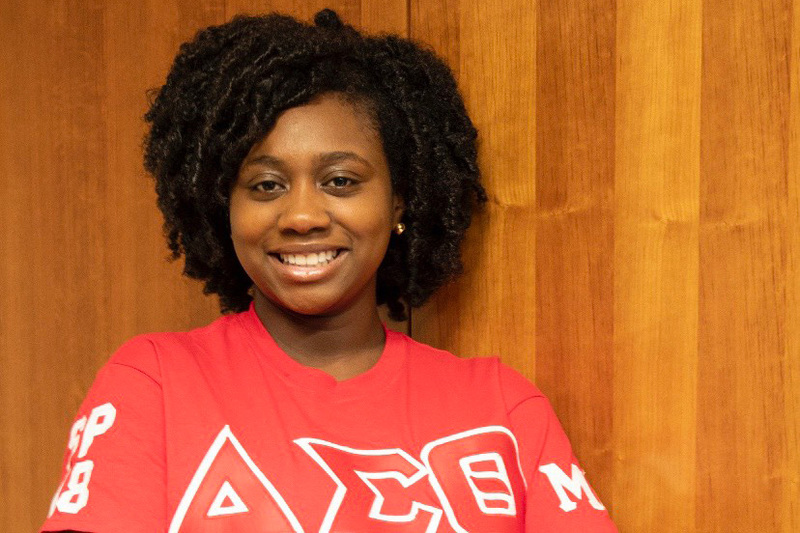 Students involved in the chapters wanted to revive the organization to ensure all black Greek-letter organizations can plan collaborative fundraising activities and programming, she said. Hunter-Hobson added that the council will host a Chipotle fundraiser next month and is hoping to organize a step show, a form of percussive dance that uses hand claps and spoken word, this semester. Hunter-Hobson said chapters in the council make up a relatively small but “united” community compared to other Greek councils. Chapter and council leaders wrote the bylaws and constitution for the organization during weekly meetings last semester. The documents allow chapter leaders to apply for recognition from the NPHC’s national organization this spring, she said. National recognition grants the council access to alumni in the D.C. area and allows members to attend the organization’s national conference. The six NPHC chapter leaders declined to comment, deferring to Hunter-Hobson. Oscar Barrios, the vice president of the NPHC and a member of Phi Beta Sigma, Inc., said the council was “necessary” for historically black sororities and fraternities to be “recognized and respected” by students and administrators. He said the council also gives black organizations a representative body that can elevate students’ voices to officials. “We wanted to show everyone on our campus that we are unified and are committed to serving the community through a combination of service and events,” he said in an email. Ethan Stubbs, the assistant director of fraternity and sorority life, said Greek life staff have worked “collaboratively” with all four Greek-letter councils to advise student leaders. He said officials have been and will continue to be a resource for Greek-letter organizations. “We look forward to seeing the progress the councils make working together to provide more resources for those within the community,” Stubbs said in an email.